Since the launch of the first C-Class (Mercedes-Benz 190) back in 1982, Mercedes-Benz has recorded a sales figure of 10 million C-Class sedan and estate models across the globe. To honour the occasion Merc has come out with the special celebration edition C220 CDI sedan you see here. And there’s just 500 of these exclusive, aesthetically enhanced ‘Edition C' diesels that are to be sold here in India. So, what’s new about this limited edition Merc? To begin with, the C220 Edition C shares all mechanical components with the current C220 CDI that’s already on sale in the country, like the in-line 2,143cc diesel powered heart that’s mated to the responsive 7G-TRONIC transmission, suspension configuration and other mechanical bits. What’s different with the Edition C are its exterior design tweaks in the form of the AMG style bumper and sideskirts, blacked out headlamps, some Edition C badges on the flanks and some mighty fine looking two-tone, 17-inch 5-spoke alloy wheels. There are no performance modifications to the limited edition Merc which means the the diesel unit under the hood retains the 170bhp, 400Nm power output figures. Performance is strong from over the 2000rpm with a refined and linear power delivery. Mercedes claims the 220 CDI takes all of 8.1secs to breach the 100kph mark, with a top whack of 231kph. The steering, although not as precise as the BMW 3 series’, has a nice weighty feel and offers good feedback driving at all speeds. Just as before, comfort and refinement with a hint of lunacy on tap remain a forte with this C-Class. We were quite impressed with the ride quality, which wasn’t as harsh as we expected, after seeing those low profile 225/45 R17 tyres on the Merc. This C features Agility Control suspension system which basically means there’s no option that allows you to manually adjust suspension settings, rather the car manages the suspension according to Eco or Sport drive modes that have been selected. The suspension stiffens and throttle response sharpen up in 'S' mode with the gearbox hanging on to every gear for a longer duration as compared to the more relaxed Economy mode driving. The Edition C houses some more aesthetically pleasing features like part leather part suede microfiber upholstery and contrast stitching. The Limited Edition car also comes with sat-nav system as standard, start-stop technology for assisting fuel conservation, as well as a host of safety tech like Parktronic sensors, 6 airbags and adaptive brake in addition to the ABS, BAS, ASR, ESP and crash responsive pedals. The more aesthetically pleasing limited Edition C comes at a price of Rs 39.16 lakh (ex-showroom, Mumbai) which translates to a Rs 3.36 lakh increase in cost over the regular C220 CDI model. The Edition C isn’t overly appealing with that inflamed price tag, considering the limited edition car doesn’t feature any performance upgrades. 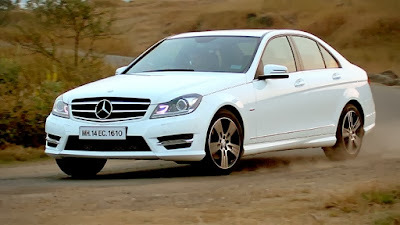 The regular C 220 CDI is the more value-for money option if you seek a diesel luxury-sports Mercedes sedan.